コンピューターおばあちゃん's pop'n music banner, as of pop'n music 16.
yume no uchuu ryokou, kitto dekiru hi ga kuru." Whoa, whoa, whoa whoa whoa whoa whoa! Math, Literature, Social Studies - bring it on! English is a no-brainer, with her dentures clacking, she does her A,B,C! Yay, yay - I love her so much! "Please, live long - live forever. The day will come when you fulfill your dreams of space travel." Seeing is believing, see things happen - let's go, Grandma! The original version of コンピューターおばあちゃん is used in the jubeat series, while a cover version by ALT appears in the pop'n music series. A long version of the コンピューターおばあちゃん cover appears on the 0/1 ANGEL album. コンピューターおばあちゃん received a long version nearly one year after being removed in pop'n music 19 TUNE STREET. It was the only licensed song present on the album. It is the only song on the 0/1 ANGEL album to not be included on the BONUS TRACK "A.I.ReMIX" medley from the same album. 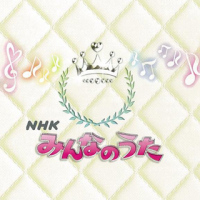 コンピューターおばあちゃん's old pop'n music banner. コンピューターおばあちゃん was originally composed by Ryuichi Ito and produced by Yellow Magic Orchestra founder Ryuichi Sakamoto. It was used as one of the themes to a NHK radio show called Sound Street (サウンドストリート) in 1981, and was originally sung by Shuuko Sakai. In addition to this, コンピューターおばあちゃん was broadcasted on the five minute NHK TV and radio program Minna no uta (みんなのうた) that same year. Mimi and Nyami appear alongside Alt in her animations. It's "Alt", the electronic computer idol. Did she install the Japanese dictionary, hopefully leading to an exciting power-up? jubeat to clan difficulty rated from 1 to 10. This page was last edited on 1 April 2019, at 04:30.